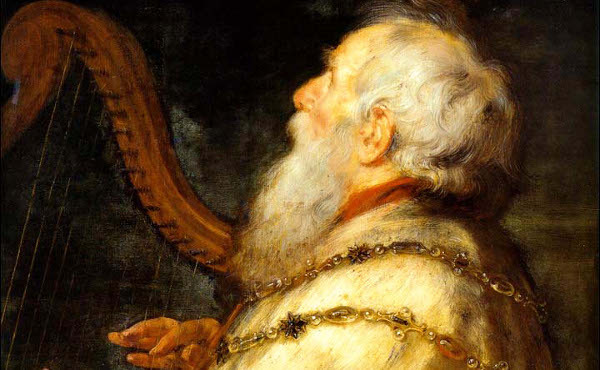 King David plays a key role in Sacred Scripture. More pages are devoted to his life than to any other person in the Old Testament. He "is par excellence the king 'after God's own heart,' the shepherd who prays for his people and prays in their name. His submission to the will of God, his praise and his repentance will be a model for the prayer of the people." After considering the role of faith in the life of Moses, and seeing the deep tie between living a life of faith and fully accepting one's own vocation, the example of David can help us to appreciate how faith entails an active attitude of trust and abandonment in God's hands, even when faced with one's own falls and sins. The two books of Samuel and the first book of Kings describe the history of King David with great realism, although not always in chronological order. His life was filled with challenges and trials; the sacred author stresses that God is always with David, and that David puts himself in God's hands in moments of danger. He abandons himself completely to the Lord's will, with "the certainty that, however harsh the trial, however difficult the problems, however acute the suffering may be, we shall never fall from God's hands, those hands that created us, that sustain us and that accompany us on our way through life, because they are guided by an infinite and faithful love." Our attention is also drawn to the way in which God's plans were fulfilled in David. He was anointed king by the prophet Samuel after God chose him in spite of his being the most insignificant among his brothers: the Lord sees not as man sees; man looks on the outward appearance, but the Lord looks on the heart. The anointing by itself did not give the throne to David. He had to fight against the opposition of Saul, before being proclaimed and anointed as King of Judah by the people. And seven more years were to go by before he was proclaimed king of all of Israel, after a bitter struggle with Saul's son Ishbosheth. And David perceived that the Lord had established him king over Israel, and that he had exalted his kingdom for the sake of his people Israel. At first sight it might seem that David attained the throne by his own courage and shrewdness. But his story teaches us that "the man of faith sees life, in all its dimensions, from a new perspective: that which is given us by God." Sacred Scripture shows us that God counts on human initiative and effort to carry out his plans. What would have happened if David, a man of faith, had thought that it was enough to let time go by to receive what God had promised him, or had done nothing, but just waited for the people to acclaim him? Many moments in the history of David allow us to contemplate the example of his faith. He carries out his duties, trusting that God is at his side and will give him success. A well-known episode is his combat against Goliath, the giant in the Philistine army. The text describes the Philistine's immense size and armaments, and the comparative weakness of David, a small shepherd unskilled in warfare, whose only weapon is his sling. But the greatest contrast is in the attitude of the two combatants. The pride of the Philistine, who defies the armies of the living God, contrasts with the faith of David, who goes out to fight in the name of the Lord of hosts, convinced that the Lord who delivered me from the paw of the lion and from the paw of the bear, will deliver me from the hand of this Philistine. It was his faith that moved David to prepare himself as best he could. He took as his weapon the sling, whose power he knew well, and carefully chose the stones he was going to launch. The means were disproportionate to the arms of his enemy, but with them he gained the victory: "Serve your God unwaveringly, be faithful to him, and worry about nothing else. For it is indeed true that 'if you set your hearts on the kingdom of God and on his righteousness, he will give you all these other things—material necessities, the means—as well.'" David's faith and trust in God led him to make use of all his skill. This is how Christians should struggle to bring forward the works of God: for "whoever really lives his faith knows that the goods of the world are means, and uses them generously, heroically." David made use of all the means available, while also entrusting the results of his actions to God's hands. His faith in God led him not to lose courage, even when circumstances became dramatic: various passages from Scripture, in their multiple allusions, confirm for us that inter médium móntium pertransíbunt aquae (Ps 103/104:10)—the waters shall pass through the mountains. This certainty is opposed to the slightest hint of discouragement, even when the obstacles seem to tower as high as the mountain peaks. And this is the right path to reach Heaven, with the assurance that the divine waters will wash away all our limitations and draw impetus from them to bring us to God. David's life teaches us another aspect of placing oneself in God's hands. The Bible makes it very clear that David was a sinner. Perhaps the best-known episode was his adultery with Bathsheba. It was his deadened will that led to this sin, a will that eventually became twisted, forgetting the immense graces he had received from God. The book of Samuel tells us that when the war against the Amorites was about to begin, David sent his army out to fight. But he himself remained behind in Jerusalem. Gradually we are shown the circumstances that led to David's moral fall: he abandoned his duty to lead the army, as was then habitual among kings, preferring to remain comfortably in the city; he spent the day lazily, getting up in the afternoon and killing time on the terrace. After an indiscreet and imprudent failure to guard his sight, he accepted the temptation, sent messengers to find out whether he could act as he wished, and finally, he committed the grave sin of adultery. All of this was followed by an even greater sin, the murder of Urias, Bathsheba's legitimate husband. This episode shows the sad capacity of the human heart to do evil, notwithstanding the person's good initial dispositions or the divine gifts received. David acted in a way that might seem beyond belief if we look at sacred history and consider the faith that he showed in the past. But he had allowed negligence and sensuality to corrupt his will. The Biblical teaching is clear: when one slackens in striving for the good, one's will can become twisted until it completely darkens the intellect, leading a person to commit the most shameful crimes. All Christians are exposed to this danger. St. Josemaria wrote: "Do not become alarmed or discouraged to discover that you have failings—and such failings! Struggle to uproot them. And as you do so, be convinced that it is even a good thing to be aware of all those weaknesses, for otherwise you would be proud. And pride separates us from God." God made use of the prophet Nathan to free the king from his sad situation. He presents David with a parable of striking beauty, one of the first that we find in the Bible. The prophet describes a rich man who wanted to entertain a guest and, instead of using his own wealth, robbed a poor man of his only lamb. When David became enraged against this rich man, Nathan showed him that he was the rich man, and David had to acknowledge his sin: I have sinned against the Lord. What especially draws our attention in this episode is Nathan's noble refinement in making the king see the great evil he has committed. Through his words, Nathan succeeds in awakening David's conscience and faith, and encourages him to seek God's forgiveness, which is granted to him when he confesses his sin to God. It is the beginning of a new conversion, which leads David to draw even closer to the God of Israel. This is a practical example to us of how, on the path to sanctity, it is less serious to fall than to remain on the ground. According to an ancient tradition, David's sorrow for his sin is reflected in the Psalm Miserere. In this prayer, the Psalmist sincerely acknowledges the evil he has committed, and confesses that his sin has, above all, offended the Maker of all things; and he turns to God asking that, through his goodness and mercy, he will purify him. He trusts in God's mercy, with the realization that God's grace is stronger than his own wretchedness, and promises, as a sign of his sincere sorrow, to change his life and to teach men the paths of God so that they will be converted. The Psalm reflects very clearly what David's interior disposition must have been when he perceived the magnitude of his sin. He did not think that all was lost, nor allow his fall to keep him distanced from God. Rather, it led him to know himself better, to be more humble, to get up, again and again. God's mercy is much greater than our littleness and weaknesses, which pride tries to make great. "In this adventure of love we should not be depressed by our falls, not even by serious falls, if we go to God in the sacrament of Penance contrite and resolved to improve. A Christian is not a neurotic collector of good behavior reports." Often it is we, so to speak, who are not ready to forgive ourselves, because we would like never to fall, to be perfect, flawless. God loves us as we are. Therefore "he always awaits us, loves us, has pardoned us with his Blood and pardons us every time we go to him to ask his forgiveness." He is the Father who knows us better than we do ourselves, and who responds to our weakness with patience. Indeed, the path towards sanctity "is like a dialogue between our weakness and the patience of God; it is a dialogue that, if we do it, will grant us hope." God does not want us to come to terms with our faults. He wants us to walk confidently along the paths of the interior life, without fear of falling, since we know we are in his hands. We know that, if we do fall, we will fall into God's hands, and with his grace we will get up again, if we want to. "God's patience has to call forth in us the courage to return to him, however many mistakes and sins there may be in our life." David is an example for us here. He offered the Lord what he most desires, a contrite heart, a loving heart totally directed to him, placing all its trust in him. All believers can look towards the example of this king who, with all his weaknesses, was "a passionate man of prayer, a man who knew what it meant to implore and to praise." Catechism of the Catholic Church, no. 2579. From 1 Sam 16 to 1 Kings 2:12. Benedict XVI, General audience, February 15, 2012. St. Josemaria, Christ Is Passing By, no. 46. St. Josemaria, The Way, no. 472. St. Josemaria, The Forge, no. 525. Bishop Javier Echevarria, Pastoral letter for the "Year of Faith," September 29, 2012, no. 6. St. Josemaria, The Forge, no. 181. See Pope Francis, Address, June 7, 2013. St. Josemaria, Christ Is Passing By, no. 75. Pope Francis, Regina Coeli, April 7, 2013. 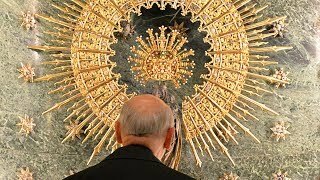 Pope Francis, Homily, April 7, 2013. Benedict XVI, General audience, June 22, 2011.